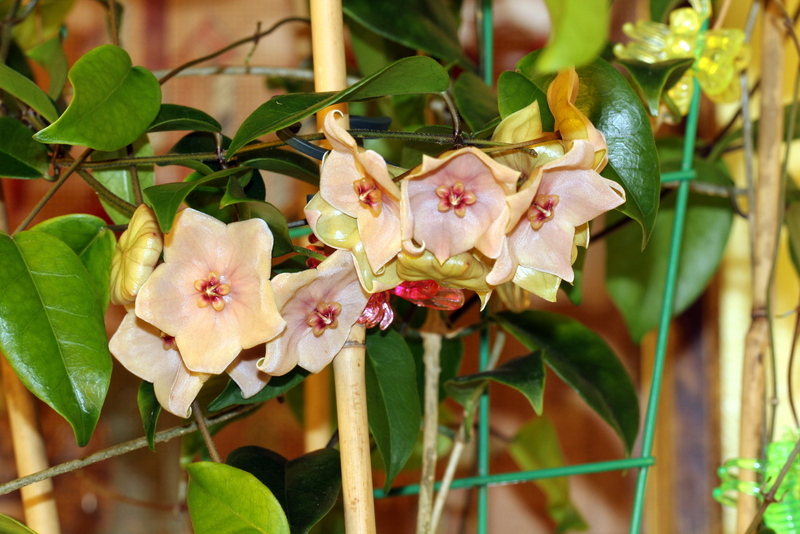 Hoya megalantha is found in the mountain rain forests, in the island nation, of Fiji. There are at least two clones of this species and mine was the one collected by Nathalie Simonsson. It is a cool growing plant that in nature grows in the trees and is misted by clouds everyday. Daytime highs in nature are around 20 degrees Celsius (68°f), and at night can drop as low as 10 degrees Celsius (50°F). Thanks to my very good friend Julie Kennedy of the U.K. I had the opportunity to bloom this difficult to locate species. She sent me a cutting of the plant rooted in Hydroton last summer, and I have been torture testing the plant ever since! I have sprayed it four times for spider mites, and exposed it to very low temperatures (44°F or 6.5°C) for long periods of time. When that didn’t work, I gave it temps of 90°F (32°C) for weeks on end. I think I finally have conditions to its liking. I set up a grow-tent in an upstairs bedroom with only two single T-5 florescent tubes to keep the heat down. I achieved a night-time temp of around 64°F (17°C) and a daytime temp of around 76°F (24°C). I continued to grow it in hydroton and watered it daily. Under these conditions it rapidly formed buds, and bloomed in short order! The plant has a light butterscotch scent and is very beautiful. If you can find it, I would highly recommend picking one up – It is a winner for sure! Hoya megalantha showing flowers and leaves. 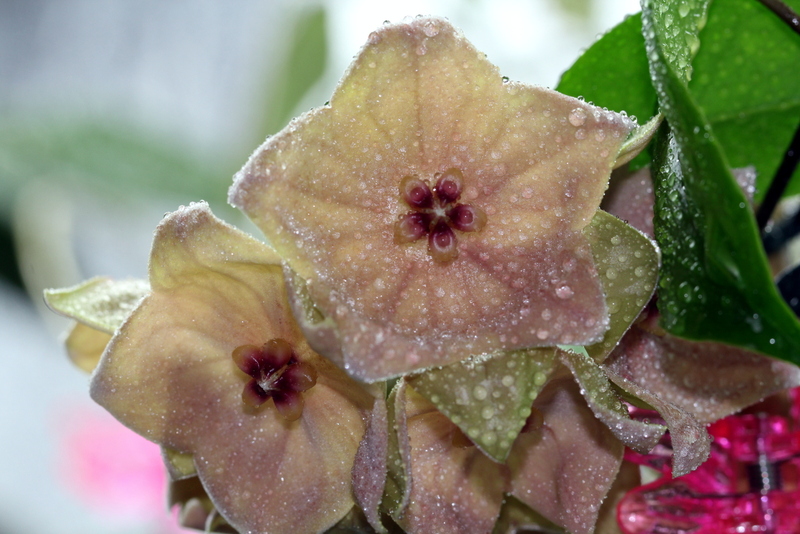 Hoya megalantha with Mountain Raindrops created with a Spray Bottle!